Ensemble Offspring are one of Australia’s leading new music ensembles and Tura is delighted to welcome them back to WA for a week-long Residency. The artists of Ensemble Offspring are internationally esteemed as an ensemble, and in their own right. Ensemble Offspring has performed together for over 20 years (the current touring group has worked together for 10 years), and is led by acclaimed percussionist and founder Claire Edwardes. In 2013 Claire was granted a prestigious Australia Council Music Fellowship, she is the first person to take home the AMC & APRA AMCOS Art Music Award for Excellence by an Individual three times and is the most recent percussionist to win the Symphony Australia Young Performers Award. Claire has been instrumental in leading, developing, and stimulating the art music scene in Australia. In their upcoming concerts in Perth and Albany, audiences will witness Zubin Kanga’s ‘truly elegant and impeccable’ pianism (The Australian) in the first-time performance of Composer-in-Residence for the Chicago Symphony, Missy Mazolli’s, piano solo Orizzonte. The London and Sydney-based pianist and composer has worked with many of the world’s leading composers and has premiered more than 80 works. His projects are focussed around expanding the possibilities of the piano through interactive multimedia. Speaking of multimedia, the concerts will also present Felicity Wilcox’s composers cut of Jean Luc Goddard’s 1962 film Vivre sa Vie. Alongside industrial sounding percussion, the bass flute and bass clarinet will ‘talk’ with the characters on-screen. Flautist Lamorna Nightingale has performed regularly as a casual member of the Sydney Symphony Orchestra, the Australian Chamber Orchestra and the Australian Opera and Ballet Orchestra, while Jason Noble is widely considered as one of Australia’s most versatile clarinettists, and has experimented with all members of the clarinet family and dabbled on saxillo, clarinis, keyboards and bagpipe. 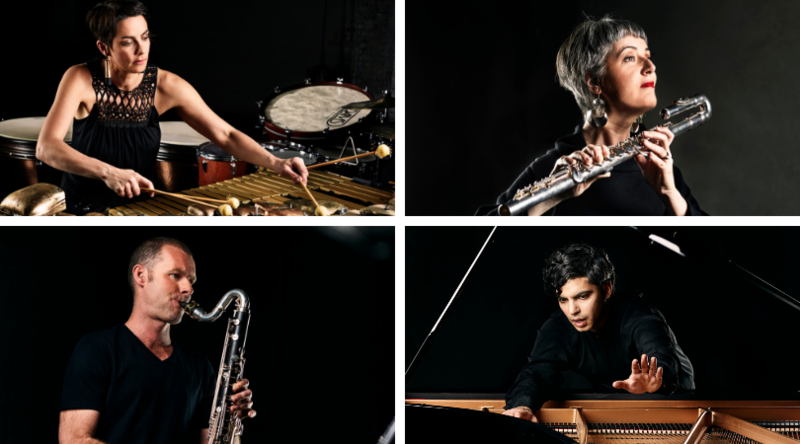 The ensemble champions new music of our time, offering an approachable experience within contemporary music, and celebrating some of the finest composers in Australia.